When I first laid my eyes on Paper Trunk's, Rockabilly line, I knew I had to get my hands on it! Released early this month, these papers and matching embellishments (chipboard & flair) showcase colors that were picked via votes by Paper Trunk fans! This collection was named after the 1950's era made famous by Elvis Presley, Buddy Holly and other artists of that time. 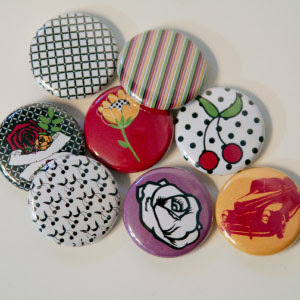 The colors (deep red, green, yellow, black and purple) as well as the designs (vintage flowers, roadster, guitar, cherries, abstract shapes and the many dots) help bring the 1950's straight into 2010. For me, this collection is a perfect canvas for creating items that showcase my daughter, who dislikes pinks, frills and lace and enjoys rich colors, eclectic items and rock-n-roll. This collection was very easy to coordinate. 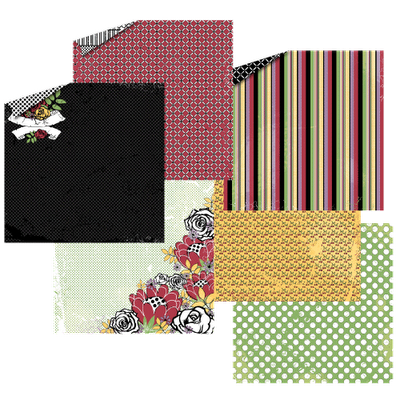 Each of the 11 designs and one journal block page feature one or more of the 5 colors that make up the collection. From cherries to roses, all the paper matches beautifully. Made of archival and acid free cardstock, the printed papers are of the highest quality and feel so good to touch. They almost have the feel of the pages in an artist's sketch pad. (I like to judge papers by feel. I do this with magazines as well...if the paper is too thin, smooth, rough, I may put it down right away!). For me, this paper was spot on for my daughter. While I wish to be able to use beautiful floral papers for scrapbook layouts, those designs just aren't 'her'. She is my "Rockabilly" girl. 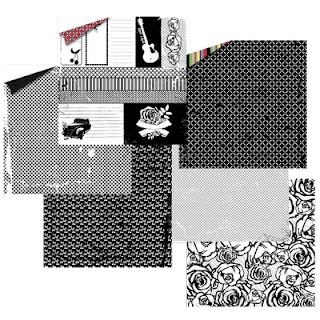 With the popularity of Guitar Hero and Rock Band, these pages would also be perfect for showcasing those young and old 'rockers' in your home! At $.80 for a double sided/two design heavyweight printed paper, I feel you get lots of bang for your buck! On the flip side, the chipboard and flair retails for $4.00/package and only contain 3 and 4 pieces/designs respectively. - Paper is RECYCLED cardstock and printed in the USA. -The double sided paper (yes, even though it is a like as well!). I have a difficult time cutting into one side for fear of losing the design of the other side! -With 11 different designs, a new scrapbooker (or one that has difficulty putting together many patterns) may opt to pick and choose a single design without realizing how awesome all 11 designs coordinate with each other. I'm a sucker for Stickles, so be forewarned: you will see those lovely glitters in my projects (although it doesn't show up very well in photographs!). I feel it is a great way to add a slight or a heavy accented area. 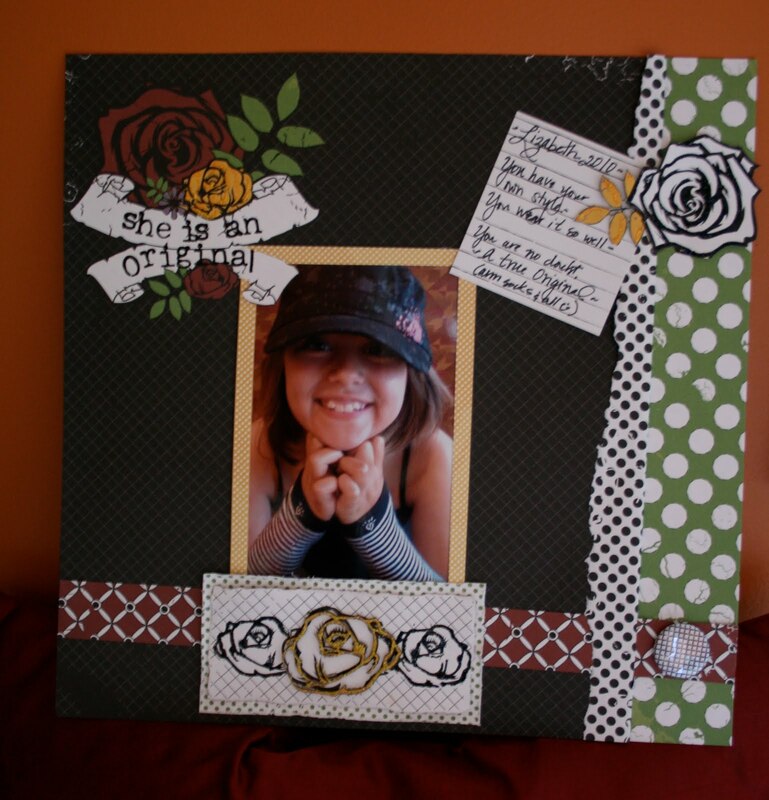 On this layout I actually used 7 of the 11 different designs, two boxes from the journal box design sheet, a chipboard flower (close up picture below, layered with yellow Stickles) and one piece of flair. I used an sharp blade to cut out end of the scroll that is printed on the black background and then placed the picture behind it. The black and white flower on the right was carefully cut from a sheet containing this beautiful floral design. 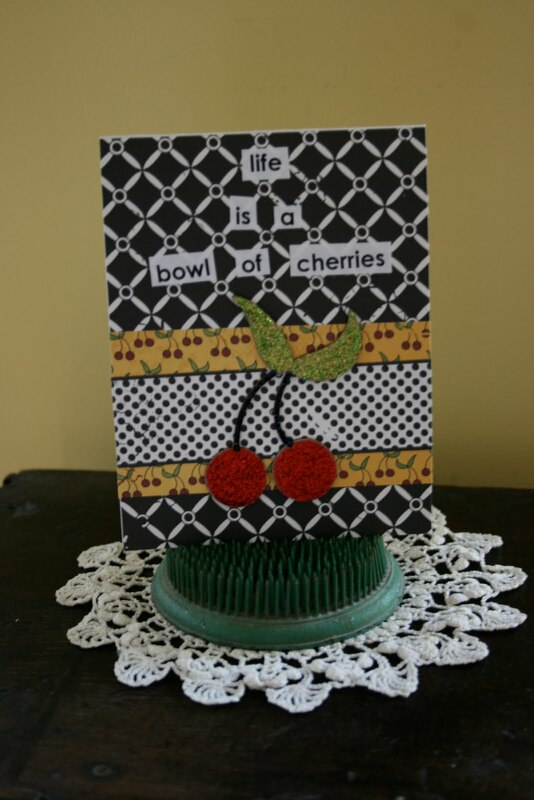 A simple card featuring three of the designs as well as a 'Stickled' chipboard cherry. 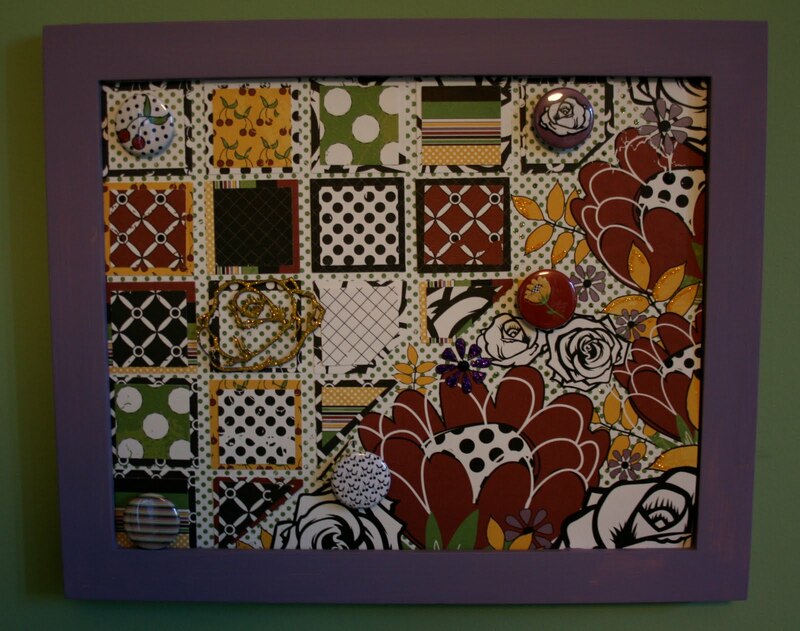 Are you able to combine a handful of patterns to create one project? Do you like the vintage, "rockabilly" 50's look? Do double sided patterned sheets encourage you or discourage you? Does a product a product and packaging made out of recycled materials and made in the USA have more of a chance of making its way home with you than a product produced out of the country and non-recycled materials? Leave a comment by midnight EST Thursday to be entered to win some of your own!! Great line, great colors. I would use this line with my boys. Thanks for a chance to win. Love this line!!! I much prefer double sided papers....so many more choices to mix and match! I'm like you in that double sided paper is fun but usually in every double sided paper pack, I LOVE both sides of ONE paper and wish they were on different sheets! Doubles sided is so great for flowers and other things though--so it's a double sided sword. I have some of Paper Trunk's rockabilly and it is of high quality! I love that it is made in the U.S. and part recycled material! I LOVE doubled sided paper! Product made from recycled materials is definitely a plus too. it's a very eclectic mix - I would love to win it! Thanks for the chance to win, and the great inspiration! Oooh I love this line! I love using double sided papers and can really make them go along way! It's fantastic that the product materials and packaging are made from recycled materials! This looks like a really fun collection! 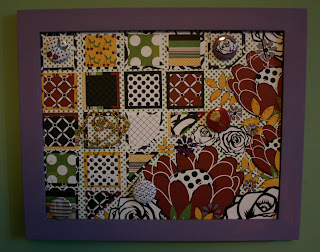 Great line...love how you used all those patterns together. Gorgeous projects. I think I am in love with this line. Love everything about it. Thanks for the great review! What a cool line! I love the projects! Love the great colour in this line - so dramatic! And the badges are super cute! i love the colors - it is nice to have some "classy" colors. and designs are beautiful - would be fun to scrap with these. I like double sided papers yet at the same time seem to buy more then I need or will use. What I first thought of when I saw this collection is 'tattoos'. My daughters have matching tats and this paper would bring them out and prompt the journaling to go along with the layout. Carrie's lines are always gorgeous...I NEED this one!!!! I love that she uses recycled products and are made in USA...although neither one is really a deciding factor for purchasing a line. Love your projects..that layout is awesome!! As for the recycled materials part - it doesn't make a difference on scrapbook products; it's the price and cuteness! It has always been one of my favorite things about Paper TArunk-recycled papers and packaging, and soy inks! Third if the price is right I will totally get this line. I can see myself creating some beautiful LOs and cards with this stuff. Plus, double sided pages are my fave because it's double your money kind of thing for me, but sometimes both of the sides are so amazing I just hate cutting it up, so for double layouts I use my fave prints as a splash of print rather than a backdrop for the whole LO. Like I will cute the papers into 2 fancy squares and cut them down the middle, so that I can use a piece of each on 1 double LO, and use the other sides on another LO. I like this line. It would be fun for teen layouts. Honestly recycled is nice to have but I don't base my purchase on it. Same goes with made in the USA. I'm not good mixing patterns so I like when there is a coordinated line that takes the guess work out me. Double sided papers are hard to choose but look so neat in cards, envelopes, etc. I think that was about all your questions! I am so in love with this line! Thank you so much for sharing. I had never seen it before. I too have trouble with double sided papers. It makes me so sad when I love both but don't have enough to go around! I like that it's a rocker collection with a feminine edge, and no skulls! I love this collection and it would be perfect for my daughter also. She is into the whole rockabilly retro punkabilly thing,...lol. Thanks for the chance to win! Great line! Love all the fun details! I love double sided papers... so much more choice! ooohh, SO much fun! i love everything rockabilly and pinup, and this line certainly does NOT disappoint! Some Odd Girl just released a new digi image that will work perfectly with this whole theme! i wanna play! I also have a really hard time using double sided papers... I hem and haw over which side to use! I often end up using them in pieces so that I can have a little bit of both sides on my layouts. I really like this collection and LOVE what you have done with it! I haven't seen any IRL, so would love a chance to win! Thanks! I love double sided paper. If I happen on some that I think I may "need" to use both sides...I just buy twice as much!! The colors and patterns in this line are amazing. I love that this line has a vintage look without being "Old Fahsioned". I like to buy products that are green or made in the USA, however it is not a "deal maker" for me. Welcome to TSR looking forward to more of your reviews!! Love your projects!! Love, Love, Love this line!!! I always have to explain to people what rockabilly means...I am SO excited!!! 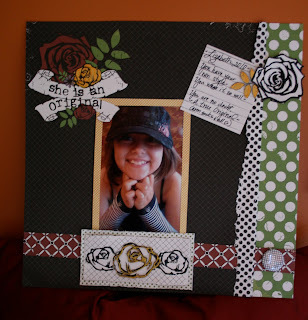 Chipboard and flair... two of my hands down favorites! What's not to love? Great review! I would love this line! We have one son that plays the guitar and one that plays the drums and this line would fit them both! I love the 50's vibe to this line. One of my favorite eras. Thanks so much for the chance to win. I LOVE double-sided paper and I am all for recycling. Looks like a great paper line.!! Cool projects, Karen! 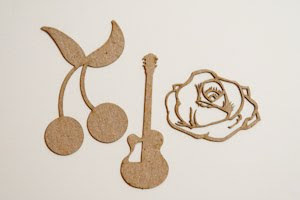 My favorite pieces from this line are the diecut guitar and the rose - not sure if they're chipboard? I like the color combo, and the fact that the paper is 2-sided is a plus for me - feels like I'm getting more value that way, even if I do have problems later because I can't decide which side to use! love this line. sometimes i enjoy dblsided paper, but hard to use. Love this paper. I love the kitschy look that brings vintage into a current look. I'm with you, I'm always afraid of cutting into dbl sided paper. When I buy single sheets, I usually buy 2 so I don't have to worry about that!!! I love using double sided papers and fussy cutting out designs from both sides of the paper. I would love to win these papers. I love this line! I love anything to do with music:) I also agree--double sided paper gets me! I don't want to use it because I won't have enough of the other side! Thanks for sharing and the chance to win! I think you're right...I too have a daughter that dislikes the pink frills. This would be perfect! I love how the flipside is all b/w. Looks like fun line! Love how the colorful paper flips to black & white on the back - love those colors very dramatic! would love to win this! I also love flair & chipboard! This would be a lot of fun to make cards out of!! 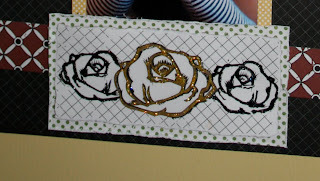 I love double sided paper... Works great with embossing. I also love that they use recycled packaging... Every little bit helps... Thanks for the great review. I had never heard of this line! Thanks for the introduction. I do like the recycle factor and I also like the darker colors. I like the colors and patterns but like you I have issues with double sided paper. I usually just buy 2 sheets so I can use both sides! Love these designs. Thanks for showing off this line. I just LOVE this line, it;s my favorite for sure! Thanks for the fun review about it!